It may be somewhat surprising, therefore, that Georgia has only recently developed a long-term strategy for its tourism industry. For many years, the country had a vision, certainly – but not yet a clear and well-designed strategy that it could implement and monitor. The country’s tourism strategy was developed by the Government of Georgia over the course of one year with support from the World Bank Group to all tourism stakeholders. The entire process involved an extensive consultation process and in-depth dialogue with a wide range of organizations and individuals from national and local governments, tour operators, investors, protected areas and heritage site managers, hotel owners, tourism educators, and citizens representing all walks of life. The design of the strategy also included interviews with key public and private sector opinion leaders and decision makers. Consultations were held with the industry professionals, aimed at identifying key challenges to tourism development and prioritizing ideas for addressing them; and drafting action plans for the implementation of those ideas. Georgia Tourism Strategy 2015-2025 is a 10-year vision and strategic plan for increasing the value and importance of tourism for the benefit of the country’s economy and ultimately its citizens. It contributes to the achievement of the World Bank Group twin goals in Georgia. The plan was formulated through a partnership between the government and the private sector with a view to maximizing tourist satisfaction, diversifying market and products, increasing the size and profitability of the industry in a sustainable way, and maximizing opportunities for job creation. The strategy strives to achieve eight strategic objectives: 1) respect, enhance, and protect Georgia’s natural and cultural heritage, 2) create unique and authentic visitor experiences centered on those natural and cultural assets, 3) enhance competitiveness, through delivery of world-class visitor services, 4) attract higher spending markets, through increased and more effective marketing and promotion, 5) expand and enhance Georgia’s ability to collect and analyze tourism data and measure industry performance, 6) expand public and private sector investment in the tourism sector, 7) enhance the business environment, to facilitate increased foreign and domestic investment, and 8) build partnerships between government, industry, non-governmental organizations, and communities that will be needed to achieve all of the above. Between 2009 and 2013, Georgia achieved one of the fastest growth rates of tourism globally: total visits to the country increased by more than 300 percent, from 1.5 million to 5.4 million. Total tourism revenues increased from approximately US$475 million to US$1.8 billion, or more than 20 times the global average during the same period. What is evident, however, from this data is that the average spending per visitor – about US$74 per day – is below the global average. In order to increase visitor spending, several opportunities can be exploited – including the development of more diversified and high-quality tourism products, enhancing visitor experiences and improving service quality – ultimately creating a world-class tourism destination that stimulates international demand beyond Georgia’s neighboring countries. 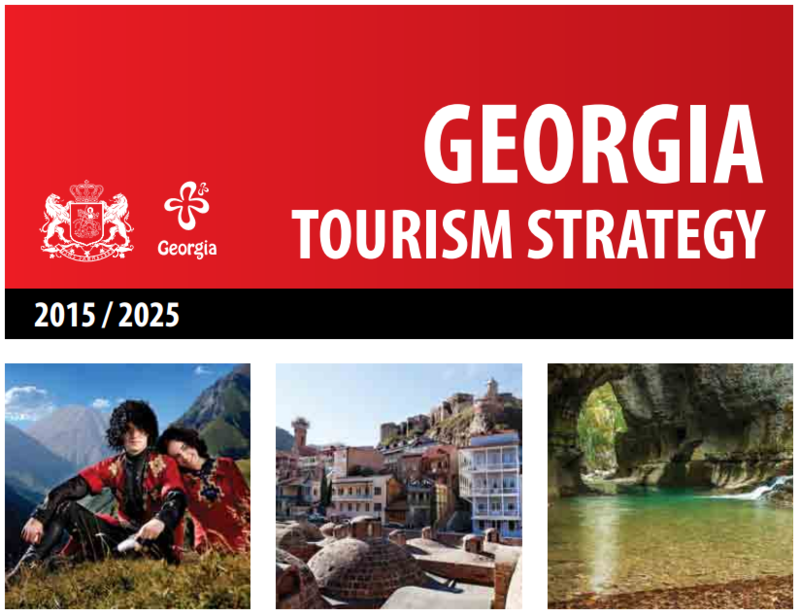 Georgia’s National Tourism Strategy 2015-2025 was presented jointly by the Ministry of Economy and Sustainable Development of Georgia and GNTA on December 4, 2015 to representatives of the country’s tourism and travel industry, government, donors, and civil society organizations. “The purpose of the Strategy is to create a road map increasing the value, profitability, and sustainability of Georgia’s tourism industry. It also aims to define and implement a plan for converting Georgia’s tourism assets into world-class tourism products and visitor experiences that will attract tourist from some of the world’s highest spending travel markets, including the European Union, North America, and East Asia,” says Mercy Tembon, World Bank Regional Director for the South Caucasus. It is envisaged that by 2025 Georgia will become well-known as a premier, year-round, high-quality tourism destination – centered on its unique cultural and natural heritage, world-class customer service, and timeless tradition of hospitality. Georgia will be at the forefront of tourism competitiveness, through strategic investments in infrastructure, education, marketing, and the development of unique Georgian visitor experiences that appeal to high-value markets around the globe.